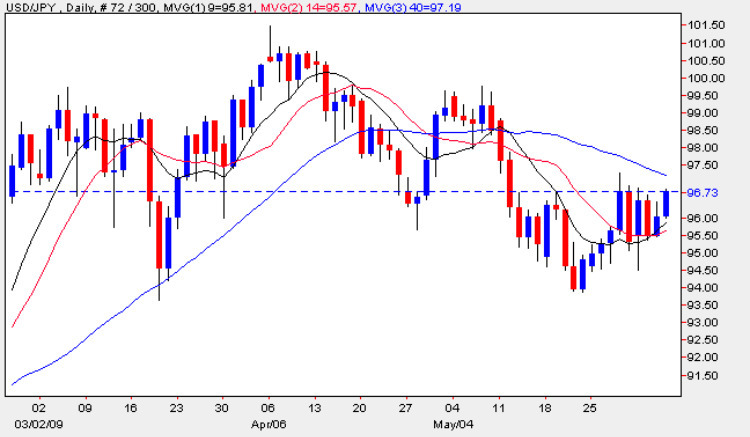 The yen to dollar currency pair continue to be one to avoid, as the messy and erratic trading pattern of the last few weeks continues unabated, with a repeated whipsaw of prices in the $94 to $98 price region, which ( in my view) is impossible to trade. As I have said several times before, with the BOJ waiting in the wings, the daily price hovering below the head and shoulders neck line, and with the three moving averages converging, now is NOT the time to be trading this currency pair, and you must therefore wait for a clear trading signal. All the fundamental news on the economic calendar for the US dollar is covered for you on the EUR/USD site, and with no significant news in Japan, either today or tomorrow, it seems we will have to wait until next week at the earliest before we are likely to see any clear direction for the dollar yen.